Algae are a diverse group of all photosynthetic organisms that are not plants. Algae are important in marine, freshwater, and some terrestrial ecosystems . Seaweeds are large marine algae. The study of algae is called phycology. Algae may be unicellular, colonial, or multicellular. Some algae, like the diatoms, are microscopically small. Other algae, like kelp, are as big as trees. Some algae, the phytoplankton , drift in the water. Other algae, the epiphitic or benthic algae, grow attached to rocks, docks, plants, and other solid objects. The major groups of eukaryotic algae are the green algae, diatoms, red algae, brown algae, and dinoflagellates. They are classified as protista. Another group, the blue-green algae, is the cyanobacteria. Some authorities do not consider the blue-green algae to be true algae because they are prokaryotes , not eukaryotes. Green Algae. Green algae are the algae most closely related to plants. They have the same pigments (chlorophyll a and b and carotenoids), the same chemicals in their cell walls (cellulose), and the same storage product (starch) as plants. Green algae may be unicellular or form filaments, nets, sheets, spheres, or complex mosslike structures. There are both freshwater and marine species. Some species of green algae live on snow, or in symbiotic associations as lichens, or with sponges or other aquatic animals. 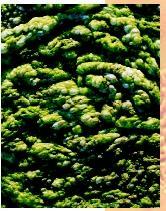 Edible green algae include Chlorella and sea lettuce. There are at least seventeen thousand species of green algae. Diatoms. Diatoms are often regarded as the most beautiful of the algae. Each diatom has a cell wall made of glass that is very finely etched with a species-specific pattern of dots and lines. The patterns on the diatom cell walls are so precise that they were used for years to test the optics of new microscopes. Diatoms are also the most abundant algae in the open ocean and responsible for about one-quarter of all the oxygen gas produced on the earth each year. Diatom populations often bloom in lakes in the spring, providing a major food for zooplankton, forming the base of the aquatic food chain. There are over one hundred thousand species of diatoms. Algae on a pond. Algae are important in freshwater as well as in marine and some terrestrial ecosystems. Red Algae. Red algae are almost exclusively marine and include many edible and economically important species, including nori and laver. Red algae are also the source of carageenan and agar , which are used as food thickeners and stabilizers. Red algae are mostly large, complex seaweeds. There are four thousand to six thousand species. Brown Algae. Brown algae are almost exclusively marine and include the largest and most complex seaweeds. Kelp, for example, may be more than 60 meters (200 feet) tall, and forms dense underwater forests off the California coast. Other important brown algae include the rockweeds and Sargassum, for which the Sargasso Sea is named. There are about fifteen hundred species of brown algae. Dinoflagellates. Dinoflagellates are unicellular algae with armor made of cellulose and flagella that cause them to spin as they swim. Dinoflagellates are found in both freshwater and marine ecosystems. Some species of dinoflagellates emit an eerie blue light when disturbed, called bioluminescence . Other dinoflagellates are toxic and responsible for red tides and outbreaks of shellfish poisoning. There are two thousand to four thousand species of dinoflagellates. Life cycles among the algae are incredibly varied. In fact, almost any type of life cycle one can imagine is displayed by some member of the algae. In an asexual life cycle, individuals reproduce by splitting. Some dinoflagellates reproduce primarily by asexual division. There are three types of sexual life cycles, which involve at some stage the fusion of gametes : gametic meiosis , zygotic meiosis, and sporic meiosis. Gametic Meiosis. In the gametic meiosis life cycle (which is employed by humans), meiosis produces the gametes, so the only haploid cells in the life cycle are the gametes. The individual that one sees is made of diploid cells. Diatoms have gametic meiosis. Zygotic Meiosis. In zygotic meiosis, the zygote undergoes meiosis, so the only cell that is diploid is the zygote. All the other cells in the organism are haploid. Many of the green algae, including sea lettuce, have zygotic meiosis. Sporic Meiosis. In sporic meiosis, there are both haploid individuals and diploid individuals within the life cycle. Meiosis produces haploid spores, which then divide to produce an individual that is made entirely of haploid cells. This individual produces gametes by mitosis . Two gametes unite and form a diploid zygote. The zygote divides to produce an individual that is made entirely of diploid cells. This individual produces spores by meiosis to complete the cycle. Because the life cycle includes two generations of individuals, a haploid generation and a diploid generation, it is called "alternation of generations." Plants and many of the green, red, and brown algae have sporic meiosis. In Japan, Korea, and China, the production of nori is a billion-dollara-year industry, but because the two generations in the nori life cycle look completely unlike each other it was not until the early twentieth century that the second generation was discovered. This discovery radically improved the ability of humans to grow nori, and there is a memorial park in Japan dedicated to the British scientist, Kathleen Drew Baker, who discovered it. Algae are the base of the aquatic food chain. Humans also eat many types of algae. The marine algae nori and kelp have been harvested in China for over two thousand years. Spirulina, a blue-green algae that is rich in protein and vitamin B, is harvested from Lake Chad in Africa. The photosynthesis done by algae is very important to the biosphere because it reduces the amount of carbon dioxide and increases the amount of oxygen in the atmosphere. Some types of algae can cause environmental problems such as red tides and fishy-tasting water. These problems are usually caused by the excessive release of nutrients from farms, sewage, and other human activities. The outbreak of the nerve-toxin-producing Pfiesteria (a dinoflagellate) on the Atlantic coast, for example, has been linked to overflowing sewage lagoons. Lembi, Carole A., and J. Robert Waaland. Algae and Human Affairs. Cambridge: Cambridge University Press, 1988. Raven, Peter H., Ray F. Evert, and Susan E. Eichorn. Biology of Plants, 6th ed. New York: W. H. Freeman and Company, 1999.